Discover our activities and our wonderfull place through videos. 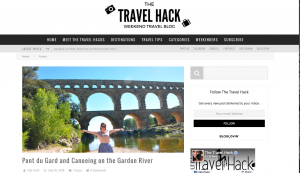 Elle Croft from thetravelerhacker tested for you a day along the Gardon and Pont du Gard! A complete presentation of our group services @ Canoe le tourbillon in Collias. Get a quote and informations. A great day to share and opportunity to thank collaboraters. Via ferrata of Collias, nice introduction of what you may experience. Beautiful scenic, 40-50 meters high, intermediate level, zip line..
Because your experience worths to be shared..